New York Magazine has an amazing feature this week and the title says it all: 26 women sharing their abortion stories. Honestly, they are heartbreaking to read because of the wall of shame the women know they are breaking. No woman should have to hide their experience, yet society or families keep these tales from being widely shared. When I cry about it, I cry alone. [My boyfriend] thinks it would make me sad to talk about, but I don’t want our baby to think we forgot. I’ve never heard of anybody else having an abortion here. The technician said, “If you have an abortion now, you’ll rupture your uterus and won’t be able to have children in the future.” I had no idea what was true. I didn’t want to regret not being able to have children. I went ahead and had my son. Those people weren’t there after I lost my job and couldn’t afford my COBRA, utilities, rent, food. Since then, I’ve had three abortions. I didn’t understand my body. I had no information. After the third time, I ran into a reproductive-justice advocate who finally taught me how to understand my fertility. Red, 30 of Pennsylvania, says simply: "The secret was devastating." Not the procedure. The secret. The doctor was grotesque. He whistled show tunes. I could hear the vacuum sucking out the fetus alongside his whistling. When I hear show tunes now, I shudder. Later, he lost his license. 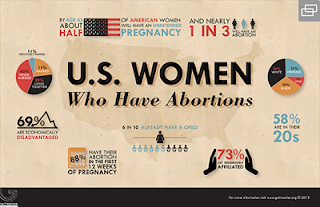 Perhaps if we could talk about abortion, we could lessen the stigma and the anti's would have less power over who decides to provide abortion care. How many amazing, gentle and caring doctors are too scared to provide abortion care because they don't want anti's to picket their homes or their children's schools? After Dr. Tiller was killed, I watched the man I didn’t know would become my doctor talking on the news, rubbed my belly, and wondered how anyone could possibly have a late-term abortion. A month later, I understood. Women think they could never because we don't share stories. I have a friend who use to volunteer at Dr. Tiller's office and heard this over and over...from women who the day before were protesting and harassing women seeking care....and would end up back on the protest line a few weeks after having her pregnancy terminated. The shame breeds hypocrisy. I wore a black turtleneck and very nice jeans—I wanted to impress the nurses. I think I even mentioned that I was in the honor society! Now I think, Who did I think I was? 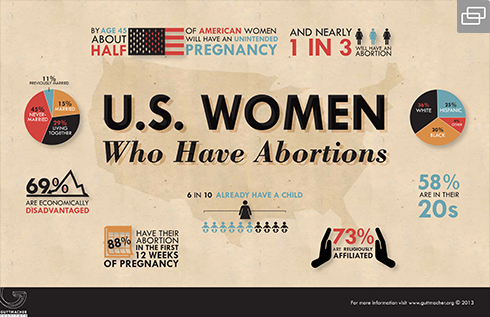 I had no idea that the average abortion patient is all of us. It's a long read and you may need to take a few days to read through them all. But you should. Some stories include supportive parents, awesome partners and world-class staff members. You may require a tissue or two.